Can bats in a cemetery attract more wildlife to St. Louis? Students from Jennings High School came to a bat survey at the Bellefontaine Cemetery on Sept. 12 to learn how to track bats using scientific equipment. The cemetery is an odd place to be at night. But for scientists who study bats, it's an opportunity to observe wildlife in an urban habitat. Last week, scientists and volunteers from the Whitney R. Harris World Ecology Center at the University of Missouri-St. Louis gathered at the Bellefontaine Cemetery to conduct a bat survey. The study continues the work some researchers started in 2014, when they looked for bats in a different section of the cemetery in a larger effort to catalog biodiversity there. Bat biologist Vona Kuczynska, a volunteer at the Harris World Ecology Center, set up nets around the cemetery's lake. She also used a detector, called Walkabout, that picks up calls from bats in the area. Joining her were other members of the organization and a group of students from Jennings High School in north St. Louis County. "It'd be really interesting to see if we have more luck catching bats down here and seeing whether bats are active here," said Kuczynska, who began the research as a graduate student at the UMSL. "Because then [the cemetery] could do more native planting here instead of up there." Bats help ecosystems by pollinating plants and controlling pests, and the presence of a large bat population often indicates a healthy environment. Urban bat populations, tend to reside and forage in green spaces, such as cemeteries, research shows. But the usually well-manicured spaces often aren't ideal habitats for them. But Kyle Cheesborough, Bellefontaine's horticulture supervisor, is willing to consider changes that would attract more wildlife. "We want to know what we can do as a 314-acre green space to make this city more diverse as far as wildlife population goes," Cheesborough said. Last week, the cemetery became a classroom to teach students how a scientist studies bats. Kuczynska showed the students the tiny transmitters that she attaches to bats and large metal antennas that she uses to track where the tagged bats move. She and another volunteer hid two transmitters in the cemetery and divided the students up into two teams that raced each other to find their transmitter first. The team with four 11th graders found their transmitter first at a tree. "I was like Zeus," said Derry Burns, who held the antenna for the group. "With his thunderbolt," added Jordan McCormack. "I liked it because we all had to work together," said Kelly Warren, who plans on pursuing a career as a veterinarian. In the end, the nets only caught one bat and a flying squirrel. But Kuczynska's bat sonar detector identified two new species of bats that she had not known were at the cemetery — the evening bat and the mouse-eared bat. For Kuczynska, that was an encouraging sign. She plans to survey more of the cemetery. Updated at 4:10 p.m. to include quotes from IDNR and 4:23 p.m. to include map. Officials in Illinois have found the first cases of a devastating bat disease known as white-nose syndrome in that state. The Illinois Department of Natural Resources says laboratory tests confirmed the fungal disease in two species of bat in four counties. Those include Monroe County in the Metro East, LaSalle County in north-central Illinois, and Hardin and Pope Counties in the southern part of the state. 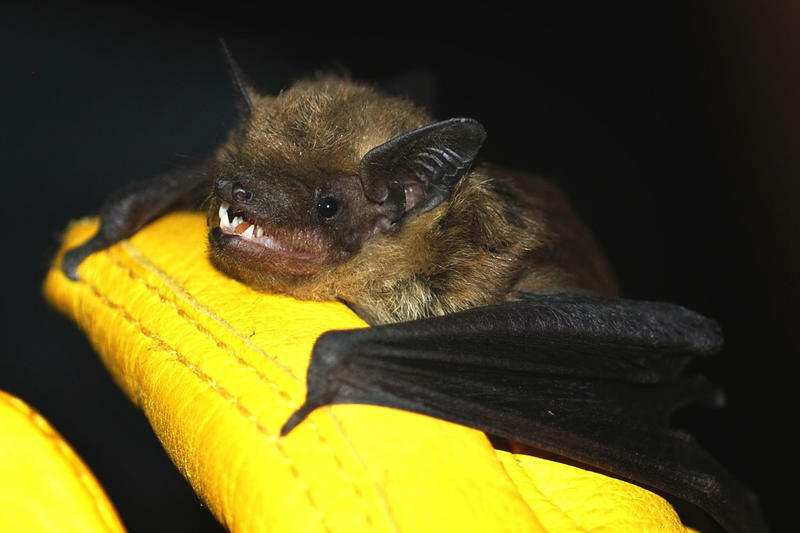 Biologists are tracking the Indiana bat at their summer locations through sites in Missouri and Illinois, hoping to gather information that will help numbers rebound for the endangered species. The bat hibernates in caves in the winter and summers in forested areas, most frequently in the central United States. Updated at 3:00 p.m. to clarify and expand description of white-nose syndrome. A disease that has killed millions of bats across the eastern U.S. has been confirmed in Missouri for the first time.